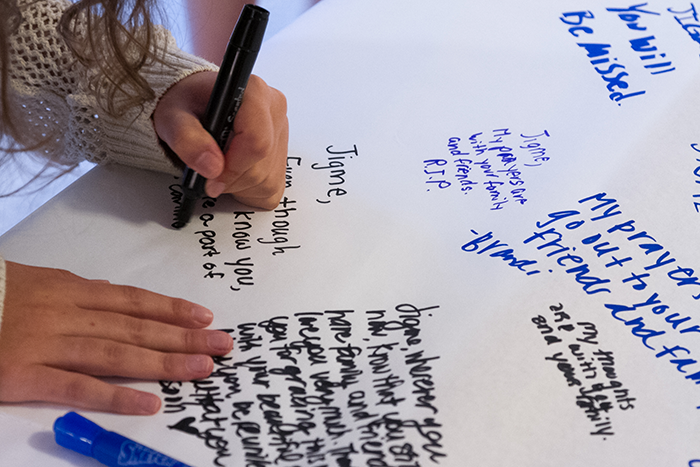 Students, faculty and staff wrote messages of sorrow and sympathy before and after the gathering to remember Nidup on Sunday, Sept. 20. In the days following the tragic loss of Jigme Nidup ’19, members of the campus community are joining together to remember the first-year student and Bhutan native, and to offer and receive support. Known for his outgoing and kind nature, Nidup died while swimming across the nearby Conodoguinet Creek last Saturday afternoon. Hundreds of students, faculty and staff shared memories of him during an impromptu gathering on Sunday, Sept. 20. Four days later, Dickinsonians joined together for an hour of communal interfaith/no-faith meditation, contemplation and solace led by Brooke Wiley, a studio technician and Buddhist priest. Additional Wednesday evening meditation and remembrance gatherings, sponsored by the Center for Service, Spirituality & Social Justice (CSSS), will be held Sept. 30 and Oct. 7 in Allison Hall's interfaith space. A Buddhist altar will be open during that time, and all are invited to come and go as they wish, light a candle, leave flowers in Nidup’s honor, sit quietly or share with one another in the Allison Hall social spaces. Students, faculty and staff also will have an opportunity to create prayer flags—an ancient symbol of peace, compassion, strength and wisdom—in Nidup’s honor. Tables will be set up in the Holland Union Building next Monday, Tuesday and Wednesday from 11 a.m. to 1 p.m., providing materials and space for those who wish to inscribe their thoughts or prayers on one of the colorful flags. The flags will then be strung together and displayed on campus. A campuswide memorial service also is being planned for some time in mid to late October, allowing time for Nidup’s family, now overseas, to attend, if they wish. More details will follow. Wellness Center staff members remain available to counsel students in need of support. "It’s inspiring to see our students coming together in an amazing way to support one another at this time," said Donna Hughes, director of the CSSS. "It’s really important for folks to talk about their grief and sadness and to be generous and gentle with themselves and each other as they process this tragedy."